Modern dentistry is always evolving, as new technologies and better ways to perform treatments are discovered. At Mason Dental – Cosmetic & Family Dentistry, we keep our office up to date, and invest in the best available dental technologies for our patients. Combining our practical experience and knowledge with cutting edge technology, we can make our procedures more comfortable, more precise, and more efficient for each of our patients in the Grapevine area, from Colleyville to Southlake. We are especially proud to offer laser dentistry as an alternative to the traditional drill. Patients can enjoy the benefits of our dental lasers in many of our offered procedures and treatments. Dental lasers allow us to achieve even greater precision than we could with a traditional drill. We use a soft tissue laser in frenectomies, gum contouring, and our gum treatment procedures for patients with periodontal disease. Patients love our dental lasers because they create less pressure and are more comfortable. Laser dentistry treatments are efficient, and heal faster than procedures performed without the use of a dental laser. We particularly love the effectiveness of our Odyssey laser treatment in gum therapy. The Odyssey Laser is the latest dental laser technology available for treating soft tissue (gums) and preventative dental care. Patients who have a gum treatment performed using the Odyssey laser can enjoy precise and effective results, less discomfort, and a faster healing time. 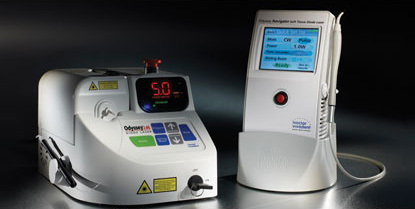 We can perform many different kinds of gum therapy procedures with our Odyssey laser. Pediatric procedures. Reduction of needles or drills for kids. To find out more about our laser dentistry treatment, call us today in Grapevine, also serving Southlake and Colleyville.